The keto diet is a hot ticket these days. It’s wildly popular, but that doesn’t mean its new or based on a whim. This heavily researched model of eating has actually been used for many years to combat really serious diseases. And today its popularity comes from a blend of incredible disease prevention/treatment benefits and weight loss/energy boosting benefits. So it’s great, but it’s honestly a little complex. After all, it’s not just about what to eat and what not to eat – the keto diet is about literally changing your metabolic state thanks to ketosis. It takes a bit of understanding, and this article’s here to provide it. Why do any of it? And how long does it take to enter ketosis? Everything you need to know about being in ketosis and getting keto adapted should be answered here. I’ll also link you to a few helpful articles that can take you more in depth on different topics. Ketosis is the metabolic state when your body burns fat for energy. Your body naturally wants to burn glucose (sugar!) for fuel. When you do not have enough glucose in the body (thanks to keto – your very low carb, very high fat diet), your body has to find that necessary fuel somewhere, so it moves right along to fat (1). To get to this point, it normally means you’re consuming somewhere around 50 grams of carbs per day or less. When your body burns this fat for fuel, your insulin levels drop and the stored fat on your body begins to release fatty acids. These fatty acids head on over to liver where they are transformed into ketones, which can actually cross the blood-brain barrier (fatty acids can’t) and energize the brain. Ketosis also happens when you’re fasting and when you’re pregnant. Let’s be clear that healthy ketosis should not be confused with harmful ketoacidosis. Ketoacidosis is when your blood has way, way, way too much sugar and ketones in the body, which makes you acidic. This happens to diabetics and alcoholics most frequently. What Is Being Keto Adapted? 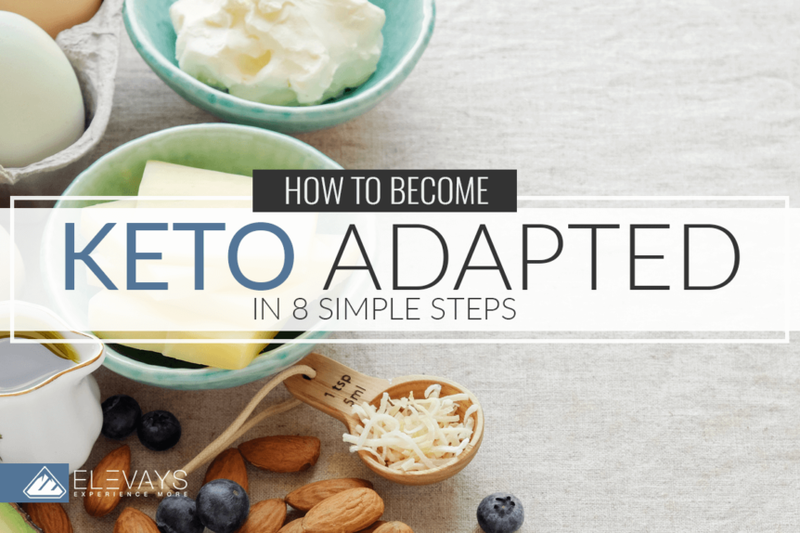 You’re going to see the phrase “keto adapted” pop up a lot when you’re researching the keto life, so what does it mean exactly? First of all, know it’s not exactly the same thing as being in ketosis. The process of ketosis is not the go-to for your body after years and years and years of finding fuel from glucose. You’re shifting your entire metabolic state, so you must expect some adjustment difficulties. Many people start experiencing something commonly called the “keto flu” – which is just as not-fun as it sounds! Essentially, you’re withdrawing from your typical carb load. How bad this keto flu is and how long it lasts will depend upon your genes as well as your habits. If you were normally a sugarholic, this may be a rough patch. If you ate pretty clean, it may not be so bad. During this time, your body is relearning everything it knows about creating fuel from the foods you eat. Eventually, you’ll land into the sweet spot where your energy goes up and you feel great – probably significantly better than you did before. And this is keto adaptation. My ultimate, informal keto adaptation definition: Your body has become familiar with its new metabolic state of burning fat for fuel, and it’s happy to be there. For you to fully experience keto adaptation, it may take a few weeks, and then it continually gets better and better as you go on. This next section answers the question: so what’s the point? If you’re going to work hard learning how to achieve ketosis and follow through the ups and downs to achieve keto adaptation – it’s not always going to be easy (carb cravings are real things, my friends!). In short, the health benefits are numerous. Whether you just want something simpler like an extra energy boost or you want something serious like slowing down the progression of Alzheimer’s – the keto diet, ketosis, and getting keto adapted may be worth it all. For a full rundown of the results, check out our article right here. There are lots of reasons you may want to try this eating model – and your doctor may even be the one who brings it to your attention first. But for any of it to work, you have to fully understand how to achieve ketosis and how to stay there, which brings me to our next section. Unfortunately, we can’t just tell our bodies to switch fuel sources. We have to shake some things up. Wanting to utilize ketosis for all its health benefits is one thing. Knowing how to achieve ketosis is a whole other thing. While you definitely get the hang of it as time goes on, it’s a little extra work at first. I want you to be successful, so I’ve compiled a list of the top 8 keto success tips for anyone wanting to know how to achieve ketosis (4, 5). The first three steps are essentially a breakdown of the keto diet, the way your macronutrient ratio has to be in order to get into ketosis and become keto adapted. After all, eating the right food is how to achieve ketosis. Period. The other tips are all the little tricks that offer a helping hand. They make it easier for consistent keto diet compliance. They will make keto adaptation a bit less daunting. This one’s is the key – without it, getting keto adapted just won’t happen. The only way you could possibly begin to be successful with ketosis is to dramatically reduce your carbohydrate intake. But how much do you need to cut carbs? It honestly depends a bit upon your body size, activity level, gender, etc. Some go as low as 20 grams per day – some go closer to 100 grams. 20 to 50 seems to be the happy spot. This is how you greatly lower the glucose, so your body can run out of it and switch to burning all that fat for fuel. It’s the foundation of everything. When you do eat carbs (mostly from your produce!) make sure they aren’t starchy. Focus on options with high nutrients, like plenty of green veggies. If you do have some fruit, stick to berries. Cutting carbs is only half the job of getting keto adapted. There’s a second essential element: you also need to boost your fat. (High protein/low carb will not work here). Most people eat anywhere from 60% to 90% fat each day. That’s a lot of fat! But it has to be. This is the food source that will be used to fuel your entire body. We have one more macronutrient to address. There may be a lot of talk about carbs and fats when you’re learning how to achieve ketosis, but the proper protein intake can either make you or break you. Too little protein, and you won’t have enough muscle mass, proper liver function, or enough fuel for hard workouts. Too much protein, and you may actually pull your body out of ketosis (or at least suppress it). Your body will process all that extra protein and turn it into glucose. It’s actually pretty common for keto dieters to be eating too much protein. Often that’s because we’re used to eating more protein, and we also need to rely on some meat for our fat content. So how do you figure out what’s right for you? It comes down to size and activity level. Both of those numbers create the range of protein grams you should probably be consuming in one day. This is an art, so experiment a bit. MCT oil, commonly found in coconut oil, can actually be converted into ketones. So if you’re wanting to know how to achieve ketosis more easily, this should be one of your go-tos. It’s going to make real difference. One of the types of MCT oils in coconut oil is called lauric acid. Studies have shown that this slowly-metabolized lauric acid can really help in sustaining your ketosis, so you can get keto adapted! MCT oil is so powerful some doctors use it for children with epilepsy who aren’t able to restrict their carb count low enough to get into ketosis themselves. This same principle allows you to have a little more carbs and protein and still be in ketosis. While adding coconut oil to your recipes is one of the simplest ways (and tastiest ways!) to get in your MCTs, you can also find them sold separately. Sometimes this can be more effective. Ketosis helps you with physical activity and physical activity helps you with ketosis. Exercise helps you use up all that glycogen you have stored up. When you don’t eat enough carbs to replace it post-workout, you’re going to make ketones. When you’re exercising both regularly and with intensity, you activate something called the GLUT-4 receptor. This actually takes the sugar out of your blood and stores it as glycogen. This is essential to help you on the days when you eat a little more carbs than normal. Plus, your workouts will help balance your blood sugar, another great step toward maintaining ketosis. Aim for a good balance of weight training, intense aerobic activity and low-intensity aerobic activity. But no matter what – don’t overtrain. That can actually ruin your ketosis. Important note: as your body is adjusting and not yet keto adapted, the first few weeks of working out may be less impressive. Hang in there, so you can get to the peak! The interesting thing about learning how to achieve ketosis is that you’ve probably already been doing it to a small degree all your life. Between dinner and breakfast, you may enter mild ketosis. That’s because fasting leads to ketosis. Now, you don’t have to fast to become keto adapted; it’s simply a tool you might use. 5:2 diet: Here you eat normally for 5 days and then you eat only about 500 to 600 calories on the other two days. The options could go on and on. Research the different methods if you’re interested in this process to find the one that seems most reasonable to you. You can learn how to achieve ketosis all day long, but how do you know once you’ve made it happen? Especially considering everyone is different and what works perfectly for someone won’t necessarily work perfectly for you? A keto breathalyzer may be the ticket. Breathe in, and learn the results. You can also test ketosis through blood and urine. Blood tests can be inconvenient and costly, but urine strips are accessible and affordable. This is a step you shouldn’t forget. You can know all the very best tips on how to achieve ketosis, but you may be missing the mark because your body needs a little different macro ratio than the average person. A simple test can help you get into ketosis and stay there long-term by cluing you in to what works and what doesn’t. While the keto diet is the eating pattern that gets you into that helpful and healthful ketosis, it’s not always 100% perfect. With low carb dieting comes low produce. With low produce can come deficiencies – common ones are low vitamin K, selenium, fiber, and electrolytes. Incorporating keto supplements can change all that for you. To learn more about these keto supplements, how they can help, and how to choose the right ones, check out our post here. Now, if you’re really good at making sure your carb count works hard for you by choosing high-fiber, nutrient-rich produce, this may not be a huge issue for you. But most people who are keto adapted still need some help in the supplement department. Another supplement you should consider is a ketosis support supplement that supplies exogenous ketones. We’ve already talked about the importance of creating our own ketones (referred to as endogenous ketones). But the cool news is you can actually take these other types of ketones in supplement form. They help you get into ketosis and stay in ketosis, so you can become keto adapted more successfully. If you work really hard and follow all these tips, how long does it take to enter ketosis? It depends. Remember – this is not how long it takes to get keto adapted. That takes much longer. How Long Until You Start Seeing Results? Many of the studies on how the keto diet affects the body are done for just a few weeks. For example, two different studies looked at the keto diet’s effect on type 2 diabetes (3). Of course, every human body is different and the goal of your results may alter the speed too. You need to factor in keto flu into the equation. You may feel worse before you feel better. The results you’re looking for may come after months of being keto adapted, not a few days of low carb/high fat eating. It also depends upon how frequently you get out of ketosis. If you find yourself giving into cravings every other day, it could take longer. How Long Does Someone Need to Stay on the Keto Diet? Is living in the state of ketosis a lifetime thing or a short-term thing? That’s the million dollar question that not everybody in the keto community agrees upon. The best way to figure out what’s right for you is to let your body do the talking. If your health is fabulous, your test results are on point, and your health provider is pleased – you may be able to keep going. If you’re struggling with deficiencies, gut issues, hormone balance issues, etc., it may be time to switch it up. Your trusted, open-minded doctor will be a key help in making this decision. Also keep in mind it doesn’t always have to be a black and white decision. Some keto dieters go back and forth regularly in a structured way. Keto carb cycling or the cyclical keto diet creates a pattern of most days in ketosis, a few days out of ketosis. We have already written a whole article on this concept, so check it out here! The most common breakdown is ketosis during the work week and high carb days on the weekends. Even if you choose a long-time plan, there are sometimes when you may need to take a break. Pregnancy is a great example of this. Hopefully this article brought you plenty of understanding not only about how to achieve ketosis, but also what ketosis and keto adaptation really are. If you think it may be right for you, realize you’ll need to get really committed. Keto adaptation will be a few weeks away! Now it’s your turn to talk to me. If you’re an experienced keto dieter, share with us how long does it take to enter ketosis for you (especially if you carb cycle and sometimes get out of ketosis)? How long did it take you to feel fully keto adapted? If you’re a newbie, share your thoughts or concerns about learning how to achieve ketosis successfully.